Nothing compares with the exquisite taste of Atlantic salmon, and our new sampler offers three delicious ways to indulge. 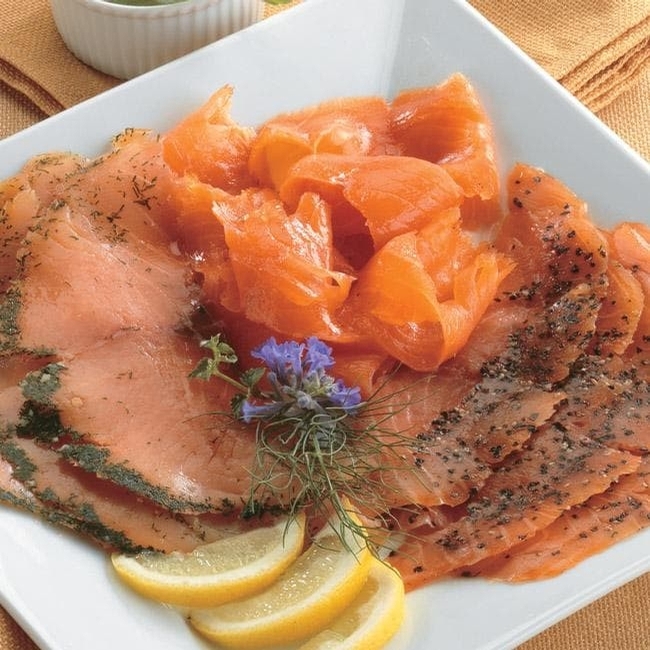 Includes Traditional Smoked Salmon, Cracked Pepper & Garlic flavored Salmon and Gravlax Style, seasoned with dill, garlic, and lemon zest. All styles are cold smoked over fruitwoods and hardwoods to impart a delicate flavor and preserve the natural moisture of the fish. Contains no artificial preservatives or ingredients. An exceptional gift for the holiday host or hostess. One 4 oz. package of each flavor.